FdM's latest Vibravoid single contains covers of three obscure psychedelic songs from the past. The first is "Colour My Mind" by the Australian band Tyrnaround recorded in 1986. The second is "La Poupee Qui Fait Non" by Michel Poinareff recorded in 1966. And the third song "Optical Sound" by the Los Angeles garage-psych band from the 60s, Human Expression. 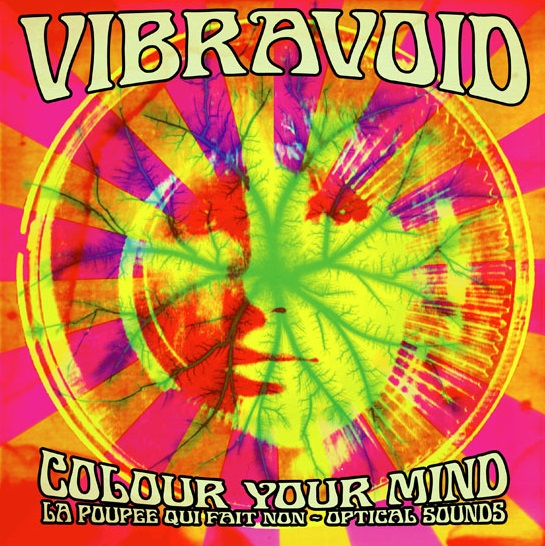 Even though "Colour My Mind" is from the mid-80s, Vibravoid has imbued it with a great 60s psych-pop feel, complete with trippy organ, guitars, and electonics. "La Poupee ..." is another excellent cover with acoustic guitar, fuzzed electronics and vocals. And "Optical Sound" is ethereal garage band psych! All three of these songs were just released on Vibravoid's latest CD Delirio Dei Sensi, but the band remixed them exclusively for this little vinyl release. As usual for these limited edition FdM singles, it is sold out. But there may be a couple of copies floating around, and of course there is always eBay as an option.